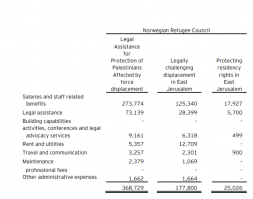 The UK, EU, and UN provide millions of dollars annually to the Norwegian Refugee Council(NRC)for massive and unprecedented political campaigns exploiting the Israeli legal system. In sharp contrast to NRC’s ostensibly humanitarian agenda, this massive program focuses on some of the most complex and sensitive political issues in the Arab-Israeli context. NRC’s intensive involvement in the Israeli legal system, if carried out directly by its governmental donors, would be considered an unacceptable violation of international norms, including the principle of national sovereignty. NRC also works closely with the Palestinian Authority (PA) in coordinating its advocacy campaigns, in violation of the principle of neutrality in humanitarian aid. NRC is centrally involved in humanitarian aid implementation in the region through its leadership in a number of UN “clusters” officially mandated to focus on protection, food security, water, and other humanitarian sectors. These UN cluster projects are also avenues for NRC’s legal advocacy. Donor governments and the NRC are highly secretive about their attempts to influence the internal affairs of Israel through the courts. The UK’s Department for International Development’s (DFID) has repeatedly rejected Freedom of Information Requests (FOI) regarding meetings and coordination with NRC officials. In a 2017 DFID document, DFID stated that it will be transferring the “legal aid in the OPTs” portfolio to the Foreign and Commonwealth Office. In describing this transition of responsibilities, DFID states that the two organizations have “worked closely together to ensure a smooth transition in order to link programmatic support for legal aid with our political messaging and diplomatic activity” (emphasis added). Many of NRC’s partners promote BDS (boycott, divestment, and sanctions) and lawfare campaigns against Israel and/or have ties to terrorist organizations. NRC’s politicized activities and partnerships violate the humanitarian principles of neutrality, impartiality, independence, and humanity. Its extensive involvement in legal advocacy also raises questions about the humanitarian visa it receives from Israel. The Israeli government has the responsibility to its citizens of investigating and publicizing the details of the NRC’s campaign to blatantly flood the courts and interfere with the policy making process in a democratic society. Engage the NRC and its donor governments in direct discussions focusing on the anti-democratic nature of this political campaign, including the secrecy with which it is conducted. Address the abuse of humanitarian visas granted to the NRC and similar political organizations. The Israeli government should create a review mechanism to verify the humanitarian work of the organization and confirm that the visa is not being used for political purposes or to disrupt democratic processes and institutions. Discontinue funding to organizations that violate democratic principles and national sovereignty. Discontinue all funding provided directly or indirectly to NGOs with ties to terrorist organizations. Ensure full transparency in funding to NGOs, including information on the NGO recipients of NRC funding, and complying with FOI requests in a manner consistent with democratic practice. Adhere to the humanitarian principles of neutrality, transparency, independence, and impartiality. Comply with the terms of its humanitarian visa. Cease all activities that are inconsistent with democratic principles and sovereignty, and which are not appropriate for humanitarian aid organizations. Immediately cease all partnerships and funding to organizations with ties to terrorist organizations. 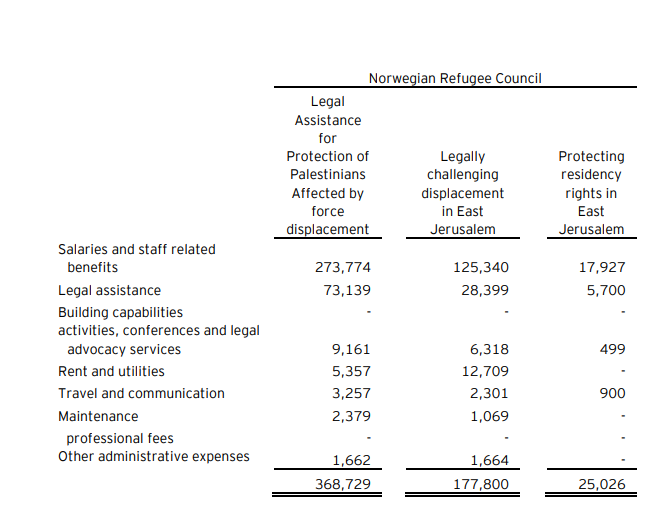 Since 2009, the Norwegian Refugee Council (NRC) has used millions of European taxpayer funds, primarily from the UK, for a campaign that exploits the Israeli justice system and is aimed at circumventing appropriate diplomatic channels. This program is unprecedented globally in its objectives, origins, methods, scope, and for its violation of sovereign and democratic norms. With an annual budget of more than $16 million, the majority of which originates with European governments, NRC submits between 600-800 cases to Israeli courts annually. NGO Monitor research shows that many of the cases appear to be selected based on furthering NRC’s (and its state funders’) political goals, and not on humanitarian objectives. Some of these cases ask the court to inappropriately rule on political, rather than legal grounds, in a manner that would undermine Israeli-Palestinian agreements such as the Oslo Accords. The extent of this foreign involvement in Israeli courts is staggering, as are the lengths that NRC and its government backers – primarily the EU, UK, and Norway– have gone to hide their roles. In addition to legal advocacy, NRC is a major player in almost every aspect of humanitarian aid in the region, fulfilling functions often attributed to the UN. At the same time, NRC utilizes its legal capacity to influence policies related to education, “protection,” and advocacy. As the following documentation and analysis demonstrates, NRC’s work in the context of the Arab-Israeli conflict exhibits blatant one-sided political advocacy that significantly deviates from its stated humanitarian mission and the internationally accepted humanitarian principles of humanity, impartiality, neutrality, and independence. According to these guidelines, humanitarian organizations are prohibited from taking sides in a conflict, or from immersing themselves in local political or ideological controversies. In addition to violating these norms through partisan involvement in the most contentious legal and political issues in the region, NRC also partners with overtly political and biased NGOs, as well as groups with links to terrorist organizations, as well as with the Palestinian Authority (a party to the conflict). NRC’s blatant disregard of the humanitarian principles and its extreme political activity raises questions about compliance with the conditions of the humanitarian visa it receives from the Israeli Ministry of Social Services. NRC has been active in Israel, the West Bank, and Gaza since 2009 and has offices in Jerusalem, Ramallah, Hebron, and Gaza. The organization employs 12 international staff and 106 national staff. In Israel, NRC is registered with an “International Humanitarian Visa” authorized by the Ministry of Social Services. In 2017, NRC’s overall budget for its Israel, West Bank, and Gaza specific programs was $16.5 million (128 million NOK). According to UN-OCHA, during the period of 2016-2017, NRC received $35.4 million in government funding for projects in the region. NRC’s annual report states that in 2016, governments provided approximately $12.6 million to programs in Israel, the West Bank, and Gaza, including $3.3 million from the EU, $2.2 million from the UK, and $1.6 million from Norway. NRC operates in Israel, the West Bank, and Gaza ostensibly as a humanitarian organization, purportedly subscribing to various norms – most importantly, the principles of humanity, neutrality, impartiality, and independence. However, NRC’s legal advocacy programs directly violate these principles, raising questions regarding the objectives of its and its donor governments’ interests. NRC is further active throughout the UN’s humanitarian aid implementation framework, known as the cluster framework. In this capacity, NRC similarly focuses on legal advocacy and targets cases related to these specific political flashpoints of the conflict, and not necessarily where legal aid is needed most. Throughout each of these areas – including through its ICLA program, the Consortium, and UN Clusters – NRC focuses legal efforts on the most politically controversial cases. For example, in the Consortium, NRC works with partner NGOs (see Appendix II below) to “transform policies and practices” and to “ensure effective and timely political interventions by the UN and Third States.” Such advocacy directly contravenes the humanitarian principles of neutrality and independence. For example, NRC provided the Israeli NGO Hamoked with approximately NIS 5.4 million (approximately $1.4 million) from 2015-2017, with the NGO partaking in over 600 legal activities during this time. In a number of these cases, Hamoked petitioned the Israeli High Court on behalf of family members of terrorists “Against the confiscation and demolition orders issued to the homes of Palestinians who are accused or suspected of committing murderous attacks.” Hamoked represented the families of terrorists responsible for the kidnapping and murder of three Israeli teens, the Har Nof massacre (together with the PFLP affiliated NGO Addameer), the Henkin family murder, and the murders of Dani Gonen and Malachi Rozenfeld. It is unclear how these endeavors fit within a humanitarian aid framework. NRC also regularly partners with the Israeli organization Jerusalem Legal Aid and Human Rights Center (JLAC). Working together since 2009, NRC provides support to JLAC’s “Legal Assistance for the Protection of Palestinians Affected by Forced Displacement” and “Legally Challenging Displacement in East Jerusalem, Combatting House Demolition” projects. In 2016, NRC provided $576,431 for these programs, including support of staff salaries and benefits, as well as programmatic expenses. NRC further neglects the humanitarian principles by working with a number of organizations that have ties to terror groups. The Palestinian Center for Human Rights (PCHR) is one of such organizations. The group’s founder and director, Raji Sourani, was “prohibited from leaving Palestine (sic) from 1977 to 1990.” According to a 1995 article in the Washington Report, Raji Sourani served “a three-year sentence [1979-1982] imposed by an Israeli court which convicted him of membership in the illegal Popular Front for the Liberation of Palestine…” He was also denied a US entry visa in 2012. Sourani was imprisoned an additional three times “in 1985 and 1986…” and held in administrative detention in 1988. From 1986 to 1987 he was “restricted from legal work for one year by an Israeli military decision issued by the Israeli Military Governor.” Furthermore, In February 2014, the PFLP organized a ceremony in Gaza honoring Sourani for winning the “Alternative Noble Prize”; Rabah Muhana, a member of the PFLP Political Bureau, delivered a speech at the prize ceremony. PCHR former Deputy Chairman of the Board of Directors Jaber Wishah is also a PFLP military official (see Appendix II for more details and other NRC partners with ties to the PFLP). The sheer number of cases submitted by NRC annually further emphasizes the political, and not humanitarian, intentions of the organization and its donors. The bombardment of Israeli courts suggests that the NGO plays a leading role in the legal discourse on the Arab-Israeli conflict. Neither the Israeli public nor authorities appear to be aware to the extent of this foreign government-funded intervention. The UK, Norway, EU, and other European countries provides millions of taxpayer dollars every year to NRC’s political advocacy campaigns, alleging that they are funding humanitarian aid. This, along with NRC’s close working relationship with the Palestinian Authority (one of the parties to the conflict), is seen as both a violation of the humanitarian principles of neutrality and independence as well as a violation of state sovereignty. In clear violation of the humanitarian principles of neutrality and independence, NRC works closely with the PA, supporting it “both locally and nationally on casework.” This self-admitted “close cooperation” between a foreign-funded NGO and a party to the conflict is highly disturbing in the context of humanitarian aid, and results in an obvious politicization of humanitarian goals. As with NRC’s legal advocacy, NRC’s partnership with the PA is present in nearly every aspect of humanitarian aid provision, leading to questions regarding whether aid for education, protection, and shelter is actually being diverted to political anti-Israel campaigns. A donor cooperation agreement between Belgium and NRC further notes that “NRC has established close coordination with the PA’s Wall and Settlement Portfolio…A significant number of cases represented by NRC partners are referred by local authorities,” working with “lawyers employed by the Palestinian Colonization and Wall Resistance Commission (C&WRC)” and providing them with “technical support.” It is unclear how NRC’s provision of a PA institution with support falls within any bounds of humanitarian aid, nor is it clear how aiding the governing authority in its biased legal campaigns aids the targeted population. The main objective of “C&WRC” is to “maintain good relations and open communication channels with the Government of Palestine (GoP) and its entities, in relation to case referrals, coordination of legal and/or technical responses in various areas of the West Bank and increasing accessibility of NRC and its partners to different vulnerable communities.” The C&WRC is an official PA body, headed by an official equivalent to a senior minister. In 2017, the Hebron municipality also signed a memorandum of understanding with NRC, agreeing to “a memorandum containing a joint strategy aimed at protecting the right to housing Land and property through the provision of legal services to citizens under the jurisdiction of the Hebron Municipality, especially citizens living in Area C and Area H2.” On April 6, 2017, NRC also took part in a meeting with the governor of Qalqiliya to discuss Israeli military actions related to the land permits behind the 1949 Armistice line. NRC, its NGO implementing partners, and the numerous European government donors are not transparent as can be seen by donors failing to provide details regarding their level of political involvement in Israeli domestic affairs and failure to note which implementing partners are receiving their taxpayer funds. NRC also itself lacks transparency, noted by its parallel and overlapping activities labeled as “humanitarian aid,” regardless of whether the activity is in fact serving political goals. This lack of donor oversight is reflected on the British government Development Tracker website, which lists disbursements from NRC as “Aid to international organizations” and “Aid to civil society organisations / NGOs” without mentioning the name of the NGO that actually receives the government funds. Based on this lack of transparency, NGO Monitor submitted a series of Freedom of Information (FOI) requests to DFID beginning in September 2017, asking about the scope of its partnership with NRC.6 These FOIs requested “details and documentation of all meetings about Israel and the occupied Palestinian Territories” held between DFID officials and NRC. However, with each FOI request, DFID responded by rejecting the request based on their cost limit, thereby indicating the vast number of meetings and documentation of such between DFID and NRC. DFID would then suggest that NGO Monitor narrow the requested time frame, which NGO Monitor did until reaching a six-month period between August and February 2016. However, on April 23, 2018, DFID stated that it refused to release any information relating to its interactions with NRC. It attempted to justify this “withholding [of] further information … under the exemptions at Section 27 (1) (a) (c) and (d) (International relations), section 38 (1) (a) and (b) (Health and safety), section 40 (2) (Personal information) and section 43 (2) (Commercial interests) of the Freedom of Information Act 2000,” arguing further that it needed to “consider the balance of public interest in disclosing the information.” Based on the fact that disclosing the information would serve to enhance transparency in the UK’s funding process, NGO Monitor is appealing DFID’s decision. $4,135,737 Humanitarian Support to Protect Palestinians in the West Bank (including East Jerusalem) from Forcible Transfer (OPT-17/S-NF/97624/5834) Consortium Partners Action Against Hunger (ACF), ACTED, Gruppo di Volontariato Civile (GVC), Première Urgence Internationale (PUI). Legal Aid Partners: Hamoked, Jerusalem Legal Aid Centre (JLAC), Yesh Din. Due to a lack of transparency, there is limited information regarding amounts disbursed by NRC to its NGO implementing partners. Details regarding NRC’s partnership and funding of Israeli NGOs are available based on financial documents submitted by the recipients to the Israeli Registrar of Non-Profits. Details on Palestinian NGOs are based on independent research. Hamoked makes inaccurate and inflammatory allegations of Israeli “apartheid,” “deportations,” “torture,” and “forcible transfers.” The NGO accuses Israel of “collective punishment” and the “ghetto-ization of the West Bank” (translated from original Hebrew). JLAC’s partnership with the NRC began in 2009. The NRC has renewed its two project agreements with JLAC (in the West Bank and in East Jerusalem), respectively titled “Legal Assistance for the protection of Palestinians Affected by Forced Displacement,” and ‘Legally Challenging Displacement in East Jerusalem, Combating House Demolition.” NRC funding for JLAC for these projects included support for salary and staff related benefits, activities, conferences, and legal advocacy services. PCHR is a leader of anti-Israel lawfare campaigns, ignores the existence of terrorism against Israeli civilians, and presents a distorted version of the conflict based only on the Palestinian narrative. PCHR’s founder and director, Raji Sourani, was “prohibited from leaving Palestine (sic) from 1977 to 1990.” According to a 1995 article in the Washington Report, Raji Sourani served “a three-year sentence [1979-1982] imposed by an Israeli court which convicted him of membership in the illegal Popular Front for the Liberation of Palestine…” He was also denied a US entry visa in 2012. Sourani was imprisoned an additional three times “in 1985 and 1986…” and held in administrative detention in 1988. From 1986 to 1987 he was “restricted from legal work for one year by an Israeli military decision issued by the Israeli Military Governor.” Furthermore, In February 2014, the PFLP organized a ceremony in Gaza honoring Sourani for winning the “Alternative Noble Prize.” Rabah Muhana, a member of the PFLP Political Bureau, delivered a speech at the prize ceremony. On November 14, 2017, the PFLP hosted a book launch for a book about their “leader” Ahamad Saadat. Numerous PFLP commanders and senior members attended the event and Raji Sourani also gave a speech. Refers to Palestinians as “victims of Gaza holocaust,” accuses Israel of “state terrorism,” and participates in discriminatory campaigns. Publishes statistics and findings related to what it calls “ideologically-motivated crimes” against Palestinians, as well as what it claims is a lack of Israeli law enforcement in the West Bank. According to NGO Monitor research, these oft-cited statistics are misleading and misrepresentative when taken in context. Yesh Din’s categorizations are not used by Israel or other jurisdictions around the world, thus making it impossible to properly evaluate the claims and compare the rates to other areas. Founder Michel Sabbah authored (together with Naim Ateek of Sabeel and Atallah Hanna) the 2009 Kairos Palestine document, which calls to mobilize churches worldwide in the call for BDS, compares Israel with the South African apartheid regime, and denies the Jewish historical connection to Israel in theological term. Addameer’s chairperson and co-founder, Abdul-latif Ghaith, was banned by Israel from travelling internationally due to his alleged membership in the PFLP. He was also banned from entering the West Bank in 2011-2015. Yousef Habash, the public relations officer of the Union of Health Work Committees, serves as an Addameer board member, and is apparently the nephew of PFLP founder George Habbash. Israel prevented Habash from leaving the West Bank in 2011-2012. He is also a member of the BDS National Committee. Ayman Nasser, an Addameer researcher, was arrested on October 15, 2012 for links to the PFLP. An indictment was filed attributing a number of offenses relating to membership in the PFLP and activities on behalf of the organization. On June 3, 2013 the Judea Military Court convicted Nasser, who admitted to being a member of an unlawful organization, the PFLP, and for providing services to the organization. Sumoud Saadat, an Addameer staffer, is the daughter of PFLP general secretary Ahamad Saadat who is serving a 30 year prison sentence in Israel due to his terrorist activity. Suha Al Bargouti, Addameer’s treasurer, is the wife of reported PFLP member Ahmed Qatamesh. On February 23, 2017, Anas Barghouthi, a lawyer for Addameer, pleaded guilty to membership in the PFLP. In 2015, DCI-P and American Friends Service Committee (AFSC) initiated a campaign, entitled “No Way to Treat a Child,” to “challenge Israel’s prolonged military occupation of Palestinians by exposing widespread and systematic ill-treatment of Palestinian children in the Israeli military detention system.” The groups call upon the United States government to pressure Israel to end “abuse of Palestinian children,” and encourage supporters to write members of congress on behalf of their cause. Several DCI-P board members have close ties to the PFLP. Mahmoud Jiddah, a “PFLP member,” was imprisoned by Israel for 17 years for carrying out “grenade attacks” against Israeli civilians in Jerusalem in 1968. Hassan Abed Aljawad is similarly described as a Bethlehem-based “PFLP activist,” or “leader,” representing the PFLP at public events. Fatima Daana, an attorney and board secretary, is the widow of Raed Nazzal, the former commander of the PFLP’s armed wing (the Abu Ali Mustafa Brigades) in Qalqilya. Nazzal was responsible for several terrorist attacks and was killed in 2002 in a shootout with IDF forces. Previous board members had demonstrable PFLP ties as well. From 2007 to 2014, Shawan Jabarin – a reported PFLP activist and director of Al-Haq (see below) – was a member of DCI-P’s Board of Directors. Alleged PFLP affiliates Nassar Ibrahim and Majed Nassar were also on the Board. Leader in the anti-Israel “lawfare” and BDS (boycotts, divestments and sanctions) campaigns. Regularly files lawsuits and submits politically motivated reports to the UN Human Rights Council and other international bodies seeking to impose BDS and other sanctions on Israel. Al-Haq’s General Director Shawan Jabarin has alleged ties to the PFLP terrorist organization and has been denied exit visas by Israel and Jordan. NRC’s flagship program in the West Bank and Gaza. Governments provide funding to NRC for “legal advocacy,” amounting to exploiting judicial frameworks in order to manipulate policy and bypass democratic and diplomatic frameworks. This program alone submits between 600-800 new cases to Israeli Courts per year. NRC is the lead international NGO partner of the Consortium. The other Consortium members are Action Contre la Faim (ACF), Agency for Technical Cooperation and Development (ACTED), Gruppo Volontariato Civile (GVP), and Première Urgence Internationale (PUI). Established in 2015 by DG-ECHO, Belgium, Italy, Luxembourg, Spain, and Sweden. The Consortium’s stated goals include: “Support Community empowerment and mobilization for communities living in an environment in which IHL violations are prevalent”; “Households and communities at risk of forcible transfer have access to essential services, material assistance, legal aid and emergency support”; “Seeking to promote changes in policies and practices” (emphasis added). Implementing partners include Jerusalem Legal Aid Centre (JLAC), Yesh Din, and Hamoked. NRC is one of the leading members of AIDA and provides it with provides it with administrative support. In July 2015, NRC uploaded a video, “End the Nightmares,” promoting AIDA’s #OpenGaza campaign. The propaganda film does not provide any context about the conflict or about violent attacks perpetrated by Hamas in Gaza and implies that Israel attacks only peaceful individuals without reason. The Legal Task Force coordinates legal responses by 14 Palestinian, Israeli, and international highly political NGOs,12 including those with ties to the Popular Front for the Liberation of Palestine (PFLP) terrorist group. NGO members include Defense for Children International – Palestine (DCI-P) and Addameer (both closely connected to the PFLP), Jerusalem Legal Aid and Human Rights Center (JLAC), Adalah, Al-Haq, B’Tselem, Community Action Centre (CAC), Hamoked, Ir Amim, Society of St. Yves, and Yesh Din. Works with the PA on “policy change” and “advocacy” under this framework. In contrast, when DFID received an FOI request relating to NGO Monitor, the UK government had no concerns about “privacy” or “commercial interests” and did not hesitate in providing all documents related to our organization. Due to a lack of transparency, there is limited information regarding amounts disbursed by NRC to its implementing partners. The amounts available taken from the Israeli Registrar of Non-Profits and compiled with additional NGO Monitor research. Government donors do not appear to disclose funding to this particular project, and refused to answer NGO Monitor’s Freedom of Information Request. A 2015 Protection Custer Monthly Update notes that NRC submitted an appeal regarding the Kedem Compound. The Kedem Compound is a cable car project in Jerusalem, meant to relieve traffic around the Old City. Numerous political NGOs have complained that the project will result in the “destruction and damage to the fabric of ancient Jerusalem” and contribute to the “Judaization” of East Jerusalem. NGO Monitor made similar requests in 2014 that were denied by DFID. It appears that Wishah was released as part of the Sharm el-Sheikh agreement. NRC’s ICLA program receives funding from the Consortium. Jan 2015 (See: UNICEF and its NGO Working Group: Failing Children).